Roughly chop fruit, add to food processor, pulse a few times. Add coconut, walnuts, cacao powder then process till smooth. Finally, add coconut oil, blend till smooth and glossy. 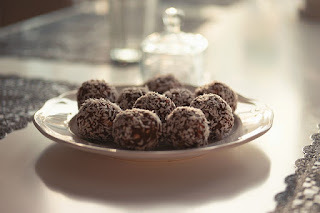 Roll into walnut sized balls, roll in coconut, cacao powder or nut/seed meal. Variations: Absolutely endless. Different dried fruits, nuts, seeds, tahini, nut butteer.